A kitchen should be functional as well as attractive and comfortable to be in. That means it must be well-designed. Good design doesn’t happen by accident, however. Below are 12 elements of a well-designed kitchen. Does your kitchen have them all? Makes Good Use of Space – There are two parts to this design feature. The first is using all the available space so nothing goes to waste. The second involves using the space well. For example, keeping commonly used things in your kitchen close together so you don’t spend all your time walking from one side of the room to the other. Has Enough Storage – A common mistake that people make when designing kitchens is not including enough storage. In addition, the smaller the available space there is, the more important it is to come up with creative storage solutions. Maximises Natural Light – Natural light is the best type of light to have in your kitchen, and well-designed kitchens make effective use of it. Has Effective, Unobtrusive Lighting – You can’t use natural light all the time so your kitchen will also need lighting. The source of the lighting, however, should be almost invisible. Its placement is important too, particularly in relation to shadows. After all, you don’t want a shadow falling onto a worktop while you are preparing food. Has Enough Power Points – You need enough power points for your appliances as well as other electrical devices. For example, it may be normal for you to charge your phone in the kitchen. Also, there should be sufficient power points for you to add additional electrical devices or appliances in the future. 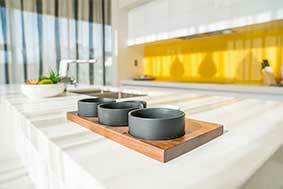 Has Attractive Worktops that Are Easy to Care For – Worktops should be high-quality, durable, and attractive. It is essential, however, that they are easy to clean and maintain. Includes New Appliances – If you are getting a new kitchen, the best advice is to get new appliances too. Takes into Consideration Traffic – Designing a kitchen well involves thinking carefully about how people use and walk-through it. In particular, walkways should be big enough to pass while safety is important too. For example, you should keep ovens and hobs away from walkways if possible, particularly if children use the kitchen. Has Effective Ventilation – Ventilation is important to protect the interior of your kitchen, to make it more comfortable to us, and to remove odours. Has a Well-Placed Bin – The design and location of your bin are important. That importance increases if you keep multiple bins in the kitchen for recycling. Many people like to hide bins, but accessibility is essential too. Has Doors That Are Well-Designed – The design of cabinet and appliance doors has to be well thought through when designing a kitchen. They must swing the right way for a start. In addition, they shouldn’t bang into anything when open, including other doors. Includes Landing Space – Landing space is counter space located beside the refrigerator, microwave, and sink. After all, there is nothing more annoying than using any of these kitchen elements with your hands full and having nowhere in the immediate vicinity to put anything. There will be other things that will be important to you for your kitchen. The above 12 elements apply to all kitchens, however, whatever the size or style.